You are not who people think you are supposed to be. You are not your relationships. You aren’t what you ate or drank last night. You aren’t your bad behavior. You aren’t your good behavior either. You are not what you think people think about you. You aren’t even what you think about you. You aren’t your stuff. You aren’t your calendar. You are not your to-do list, even when all the boxes are checked. You aren’t the bad thing someone said you are. You aren’t the good thing either. You are not the books you’ve read, the songs you sing, the mountains you climb or the cities you’ve visited. You are not your apologies or your accomplishments, your excuses or your loyalty. You are not your best day and you are not your worst. They are bits and pieces of your life, but they are not you. You are none of those things, but if you are holding on to them too tightly, they are in the way of you knowing who you really are. You may be underneath them, confused by them, distracted by them. All of those things may be so loud and heavy that you can’t hear your heart calling and you’ve forgotten who you are. You may have forgotten 50 years ago, 5 years ago or 5 minutes ago. When life gets busy, complicated, and overwhelming, it’s easy to forget who you are, but you can find your way back. Sit down. Close your eyes. Breathe. Keep doing that for a while. Then put your hands on your heart. There you are. Keep finding your way back. Do it over and over again. Keep remembering because every time you do, you’ll know what matters and what doesn’t, what makes you smile and what doesn’t. You’ll know what’s real and what isn’t. Sometimes remembering only lasts for a day or two so you have to keep coming back. When you remember who you are, it’s easier to let go of all the things you are not. 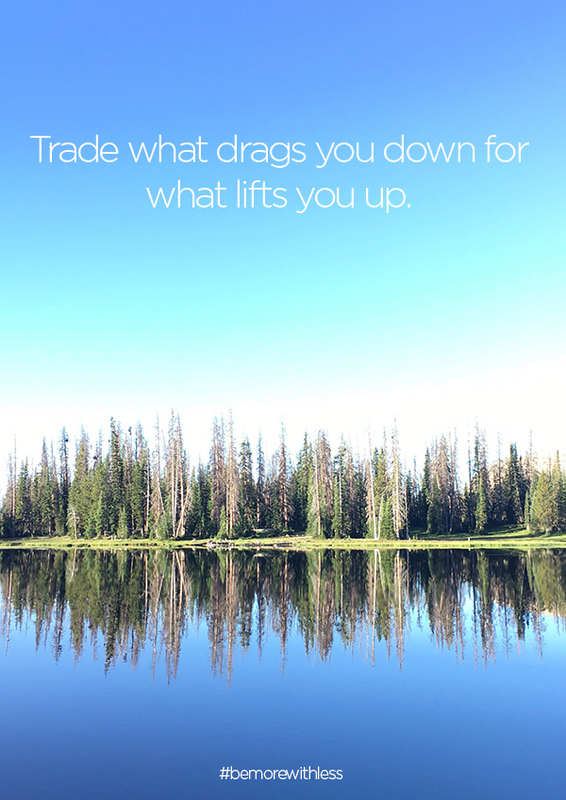 Trade what drags you down for what lifts you up. Walk away from the things that don’t support the real you so you have more room for the things that do. Sit down. Close your eyes. Breathe. Put your hands on your heart. Repeat forever. Yes, we all have to remind ourselves of this every day. WOW I’ve been struggling with many of the things written here. Anxiety, not knowing who I am, and *especially* the line of how I am not who I think others think I am. I’ve battled this for decades because of a quote I’d read as a child!! Just discussed much of this with a friend for hours today. ❤❤ Thank you! I feel like this post is my spirit animal! Just what I needed, thank you. Dear Courtney, this post is so raw, grounding and uplifting at the same time. Thank you for writing this. Coming back to that place of love, bliss, and knowing is always a relief. It’s returning home. No matter your religious preference, the foundation teaching, normally, is laying your personal baggage at the feet of a higher power, each day, resting in his presence and rising a new each day to face the world. To me, this is the daily foundation stone for a morning meditation practice. This is such an important statement. So needed for me right now. Reading it with tears in my eyes. Thank you so much for those words of freedom and rememberance.